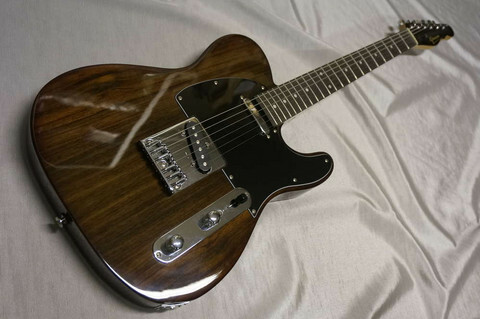 An unique tele with a linden body and rosewood top and back. It's really neat. Strings through the body and tele-type pickups. We fitted a modern bridge and made the neck PU height adjustable. This makes the guitar easy to adjust. We also fitted a modern D-shape neck. The neck is a little flatter and thinner than a C-neck which is usually found in tele models. The paint is hi-gloss. Overall this guitar is very nice and fast to play. Green TL Rosewood has a slightly warmer tone than is usual for the telecaster. The guitar is available in various designs. Equipped with the Green Standard pickups or with Lundgren pickups. All pickups have a little higher output (hotter) than the normal telecaster. Green pickups have a slightly more emphasized midrange and the treble is a little rounder. Excellently suited for blues and rock. If You want something that is truly out of the ordinary there is an option of Lundgren pickups. With Tele Lundgren Hot Bridge in bridge positio and a P90 in the neck position give a nice fat sound - a little extra you can say. Green TL Rosewood with Lundgren surely will surprise. This is among the best tele sounds we ever heard. The sound is distinct and clear, with both bite and depth that impress. The pickups are very dynamic. Lundgren Pickups are among the best you can put in a guitar and they are produced in the world's probably smallest factory, measuring about 10 square meters and it is located in Jonkoping. Talk about compact manufactoring. Whether you choose std Greens or Lundgren pickups, they have the classic tele look and the characteristic tele sound in just a different shade. Do not be fooled by the low price - here you have a very competent telecaster. Green TL Rosewood can compete with the very best telecasters regardless of where it's made. With Lundgrens we think it might even outshine the known brands. There are big words from a small manufacturer of a guitar that cost in the 500€ range - but we've got so positive feedback by many guitarists that we dare to stick our necks out. Also available as left hand. Linden body with top and back in rosewood. D-shaped neck of hard American Maple, 10 "radiusWidth of the saddle 42 mm at first nut,Thickness at first fret: 19 mm Width: 42.5 mm,12th fret, thickness 21 mm, width 52 mm. Standard Tele bridge,strings through the body. 1 volume and 1 tone control.